Posted on February 20, 2015 by No Map Required Posted in Peru, Places	. 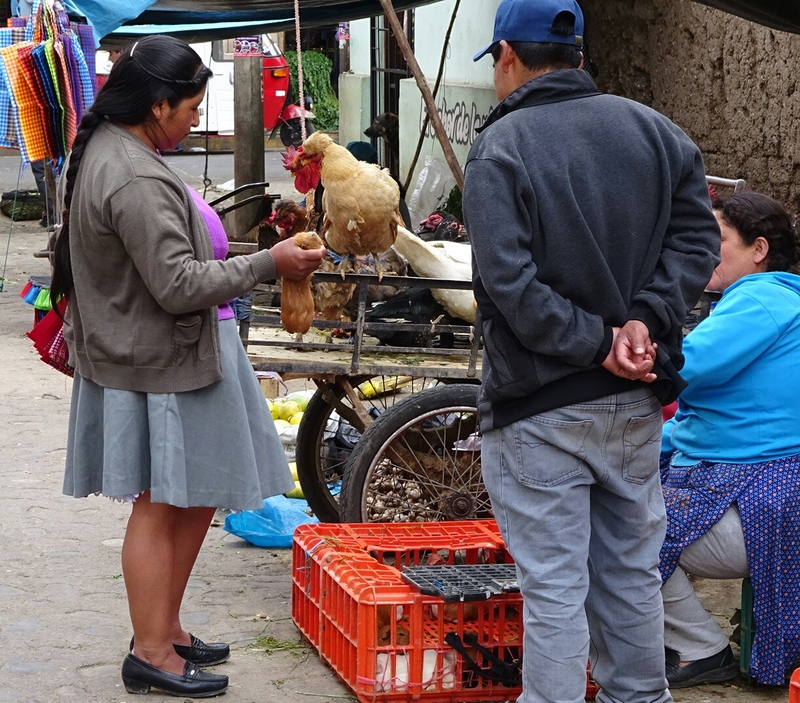 Yesterday was our last full day in Cajamarca so we went on a long walk-about, just letting the roads lead the way. 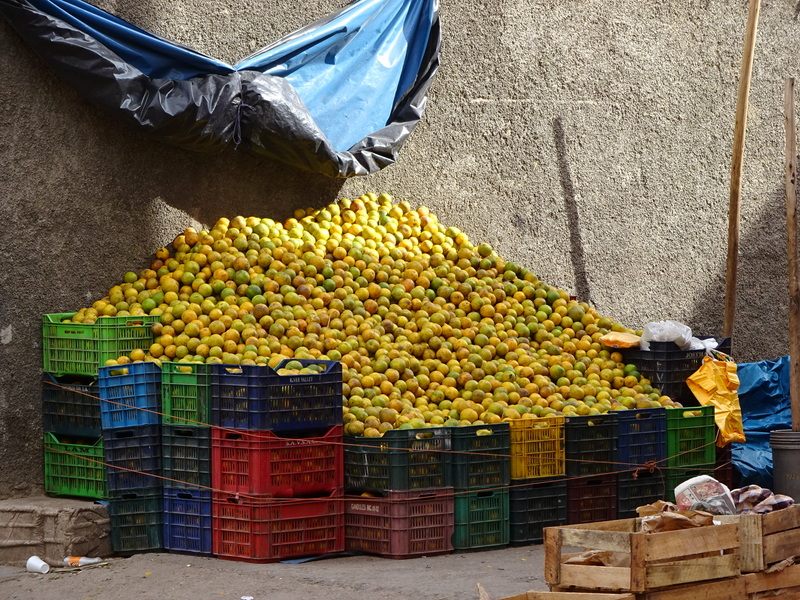 We happened upon what I call “the wholesale area” of a fruit market. I called it that because it had enormous quantities of fruit. Everywhere we looked it was stacked 10 feet high and 10 feet deep. The fruit market lead to a grain market which lead to a spice market leading on to a clothes market and ending in the town square. It was quite an adventure and a really fun final day of discovery. 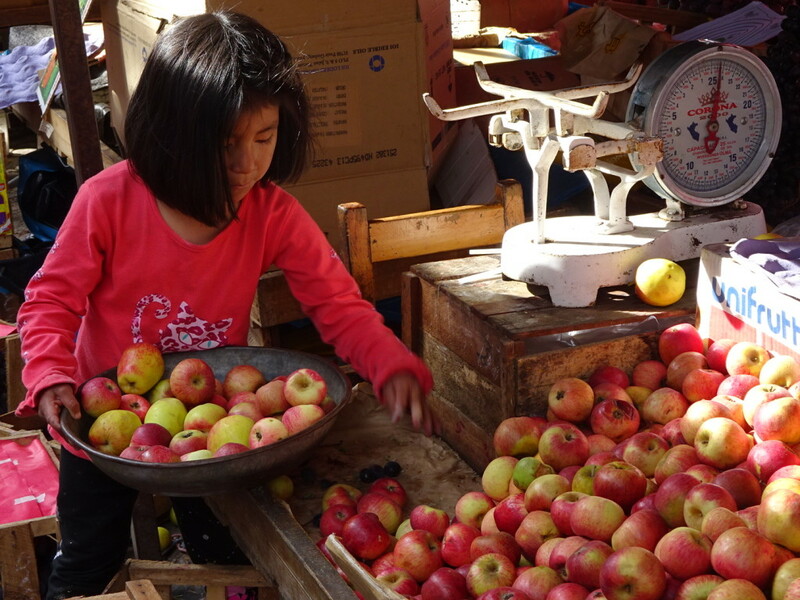 Just loved watching this little girl weigh the apples. School’s on break so hopefully most of the kiddos go back to school in a couple of weeks. 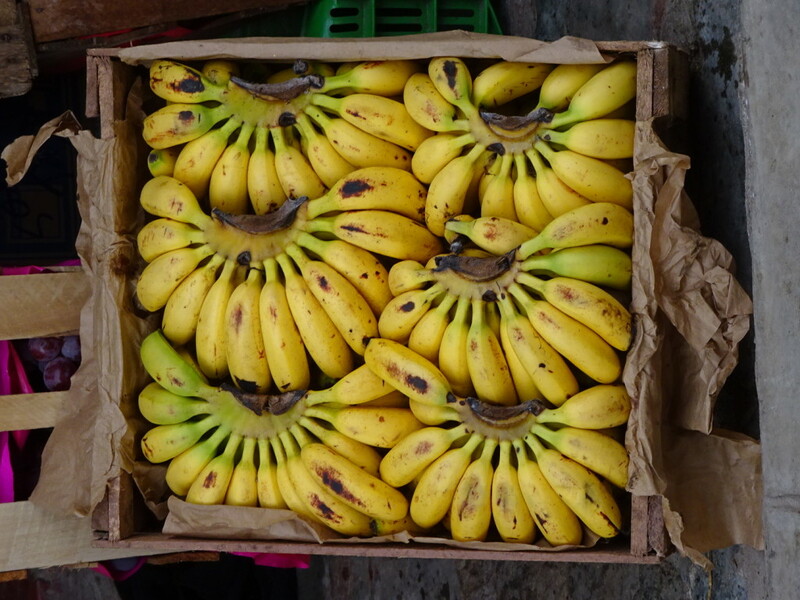 Yes, we have some bananas today! 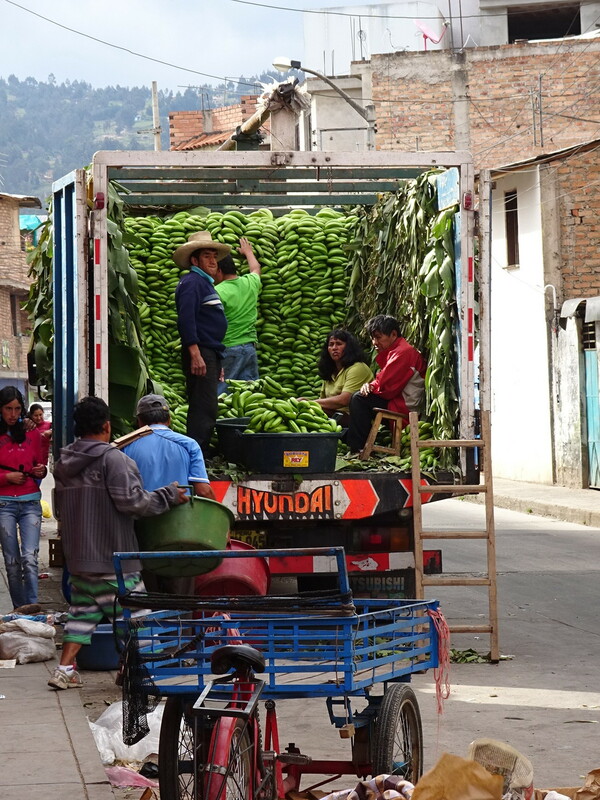 Banana truck – have you ever seen so many bananas?? 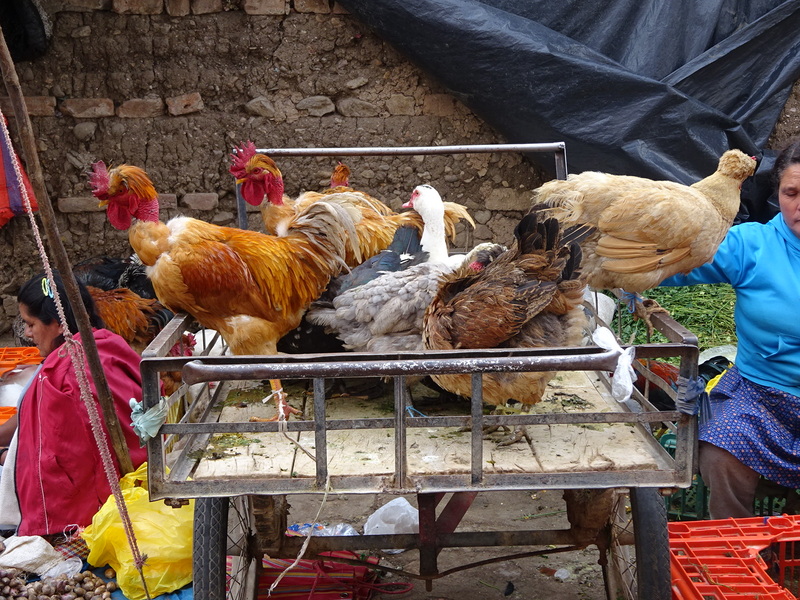 Chickens and ducks for sale. They are each teathered to the cart. This one is for everyone who liked our FB post about eating cuy (guinea pig). In the lady’s hand squirms a cuy destined for dinner tonight. in the red crate below there are a bunch more to choose from. Months ago I was told that Cuy was nothing like our furry friends back home, but I would disagree. They seem EXACTLY like our pets back home. 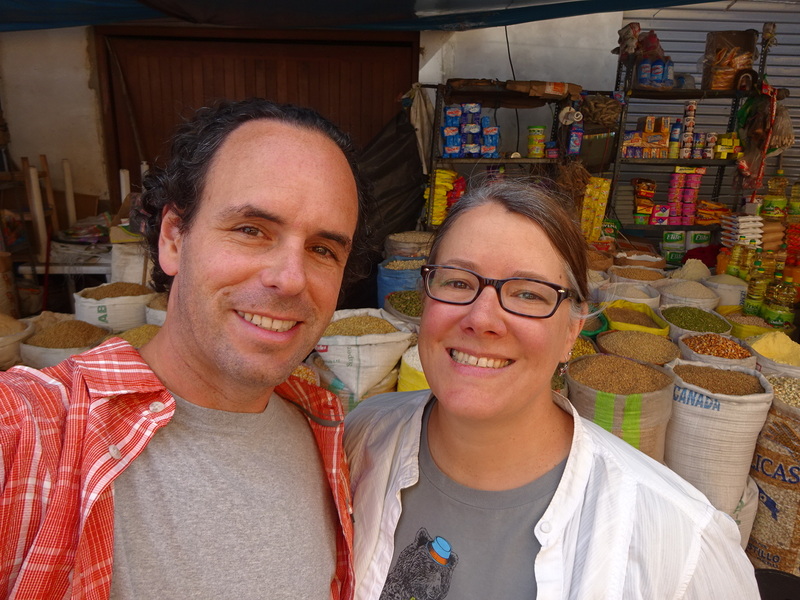 Check out all the grains, legumes and beans behind us. Just grab a scoop! Now it’s time to hop a plane and we’re off to Cusco! Bring on Machu Picchu! Hope that you will be able to spend more than half a day in Machu Picchu because it is so awesome! We stayed overnight in the little town at the railroad. It is a bus ride from that little town. Many tourists arrive in the late morning by train, go up by bus for a couple of hours and then do the return trip all in one day. It is so great that it needs multiple days if you can. Do you plan to walk/hike the trail to it? Are you guys getting younger?! It sure looks like it. Must be the reflections off our gray hairs. Makes a person look thinner AND younger! Anner says you’re now her favorite subscriber.